Time to Upgrade to the Power of Ten? If you have a 7th generation GeForce product, your gaming performance is probably still reasonable, but you might find yourself having to reduce the graphical detail and special effects of more demanding games. Your PC gaming experience could be so much more. Let us explain about the Power of Ten! You don’t need to buy a gaming PC with a £300 GPU to enjoy the very best games the PC has to offer with amazing detail levels. 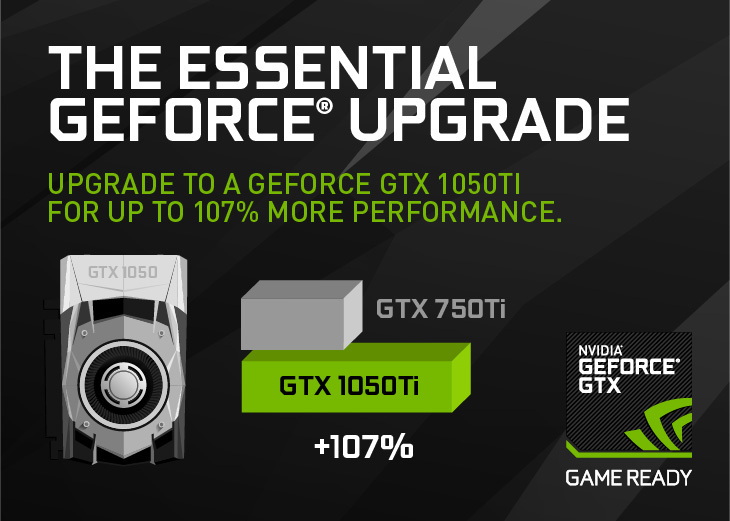 At the key 1080P “very high” detail preset, the GeForce GTX 1050 Ti could boost your performance by more than 100% compared to the card it replaces – the outgoing GeForce GTX 750Ti. Users playing on a PC armed with a GeForce GTX 760 or even a GTX 950 or GTX 960 card could gain a huge increase in performance by opting for a new gaming PC featuring the GeForce GTX 1060. 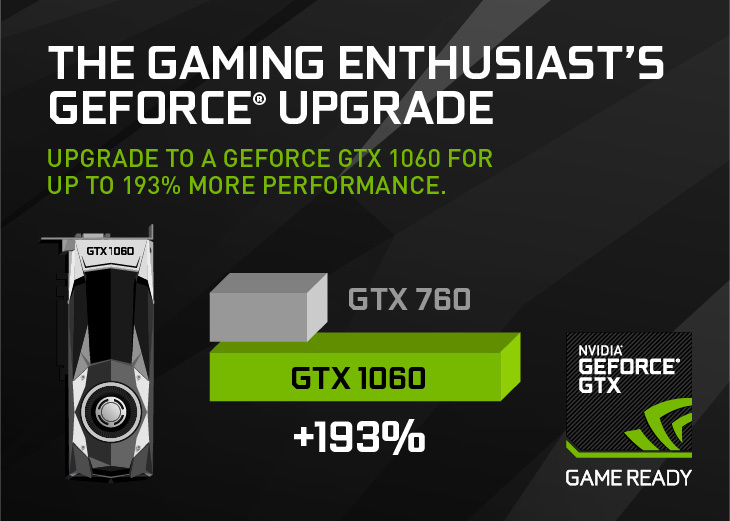 Compared to a GTX 760 you can enjoy frame rates 193% faster in Battlefield 1, The Division. GTA V, Doom and The Witcher 3. High end gaming – Triple A games at 4K and beyond. 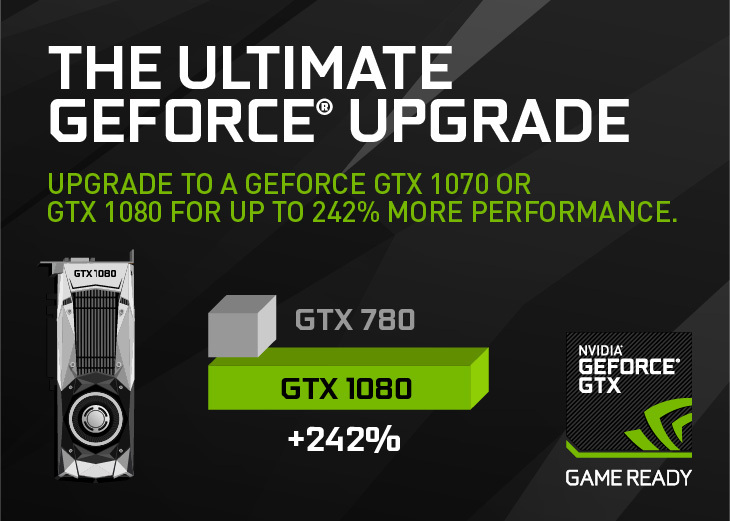 Did you know that if you are still using a system with a GeForce GTX 770 or even a GeForce GTX 780 you could gain as much as a 242% increase in performance by upgrading to a new PC with a GTX 1070 or 1080? If you are interested in gaming over multiple monitors, in 4K resolutions or using a VR headset, you’ll be particularly appreciative of this huge performance bump!